RCSWin can generate reports in both English and Metric units, and includes templates for printouts in various different units, as well as the ability to specify your own templates and number formatting. The RCS reports are fully customizable to show all calculations in the desired order of the client. In addition, RCSWin has a detailed report format that includes additional data and shows the formulas used in obtaining the results. 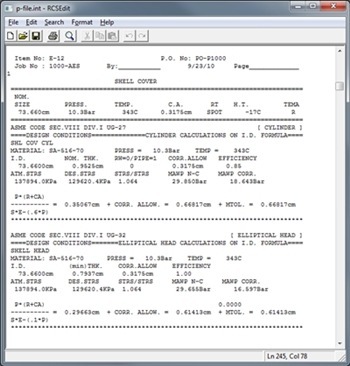 Shown at right is a sample of the short form of one of the English reports. 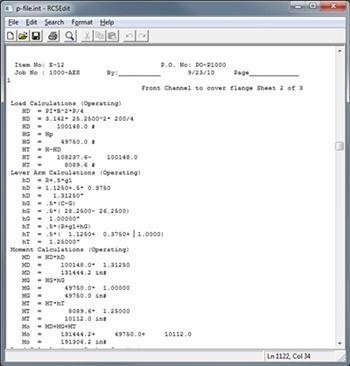 Shown at left is a sample of the short form of one of the Metric reports. Note that all fields are customizable to print with the desired number of decimals and format. Finally, we have an example of the long form of one of the English reports. 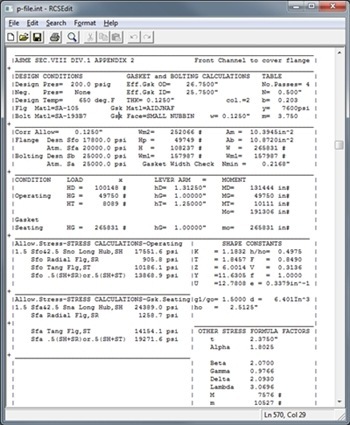 The long form shows the applicable ASME formulas and equations and plugs in variables and shows the detailed progression to obtain the final results.